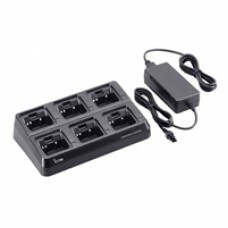 6 unit charger for radios with the BP-232N Li-Ion battery. Includes BC-157S AC adapter and six AD-122 adapter cups. Rapidly charges up to 6 BP-232N battery packs in 2.5 hours (approx.). Can be used with the BP-232FM intrinsically safe battery also. For use with Li-Ion battery only.